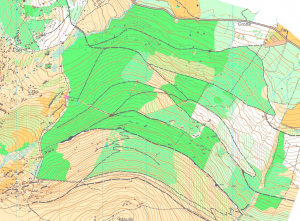 Crone Wood for Saturday’s night-O event: plenty of contours! 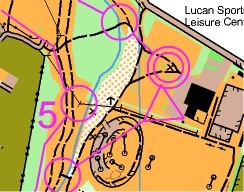 This weekend: Two Leinster events this weekend – Night orienteering at Crone Wood in Glencree on Saturday and a non-League event with three courses at Donadea, Co. Kildare on Sunday. Last Saturday’s “Dublin by Night” event at Djouce Woods attracted about 60 people, and our Colm Moran finished 3rd on the Long course, just 3 seconds adrift of second placed Josh O’Sullivan-Hourihan, with Colm Hill taking the honours. Colm’s sister Clodagh was fastest lady on the Long course. Crone this Saturday will feature two courses of 4.2 and 2.5 km, but don’t be fooled by the short distances! With night-O if you go too fast you run the risk of getting lost, if you go too slowly you run the risk of your headlight battery dying, so – as with all orienteering – it’s very much a balancing act between speed and navigation … and those fancy NiCd batteries give you no indication that they are about to fail, just “Bang!” and you’re in total darkness, so bring a spare torch. Details of the event are on the IOA Forum here. See a location map here. 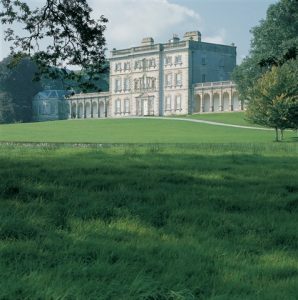 If daylight orienteering is more to your taste, CNOC’s event at Donadea, near Clane in Co. Kildare, on Sunday might be just what you need. A flat forest with a lake, an old castle, some ducks and sometimes a café. Here’s a location map. There are three courses, of 2.5, 5 and 8 km and there’s free entry for orienteers to the forest park between 10.30 and 12.30 (normally you have to pay). Mind you, you still have to pay for the orienteering, it’s only the car park that’s free! See the event details here. Here’s the Donadea map from an event last summer. Juniors: Do you know about the Irish Junior Squad? It’s not just for the elites, it’s for anyone who wants to improve their orienteering, with training sessions, coaching and orienteering tours. There’s usually a fitness test involving running in the hilly part of the Phoenix Park once or twice a year, where you can track your improvement. Have a look at the results from previous years and the course here. In the past few years the Squad has had summer training camps in Scotland, Wales, France, Sweden … and there’s a large group every year at the JK at Easter, this year in the south of England. The JK is an important selection race for juniors looking at this year’s European Youth Champs (Belarus), the Junior World Champs (Denmark) and the Junior Home International (Northern Ireland). Contact the club for more details at 3rockoc@gmail.com. Here’s a report on the technical training which followed the junior time trial last March. Here’s some great advice and encouragement for Juniors from multiple Irish Champion Niamh O’Boyle. Florencecourt, venue for the IOC2019 Sprint race. Irish Championships website just launched: The 2019 Irish Champs will be in Fermanagh and Tyrone (and a bit of Cavan!) on the May bank holiday weekend. The events will be a sprint, middle distance, long distance and relay. Cheap entries until the end of March. See details on the IOC2019 website here. Remember, if you’re running on a 3ROC relay team, the club will pay the team entry fees. Another reminder that GEN are running a course-planning workshop on Saturday 16th February in Stillorgan. See details in last week’s 3ROC News. We’ll be running a follow-up to our own course planning workshop shortly, so watch this space. 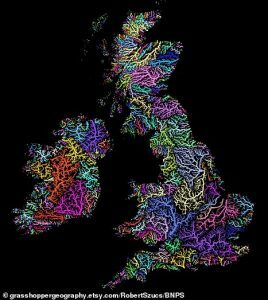 … and here’s something that might interest you: a map showing all the river basins in different colours. Nothing to do with orienteering, but a map is a map!